Thanks to the ongoing expansion of the packaged materials industry, North America is witnessing a tremendous surge in the demand for UV cure printing inks since past few years. The recent rise in the printing of packaged materials will further boost the market for UV cure printing inks in this region over the forthcoming years. According to researchers, the opportunity in the North America market for UV cure printing inks is expected to increase from US$362.9 mn in 2015 to US$865.9 mn by 2024, expanding at a CAGR of 10.30% during the period from 2016 to 2024. Upswing in Demand for Publication and Commercial Printing to Ensure Dominance of U.S. The U.S. and Canada are the key domestic markets for UV cure printing inks in North America. Among the two, the U.S. has surfaced as the leading contributor to the overall market in terms of revenue and is expected to remain dominant throughout the forecast period. 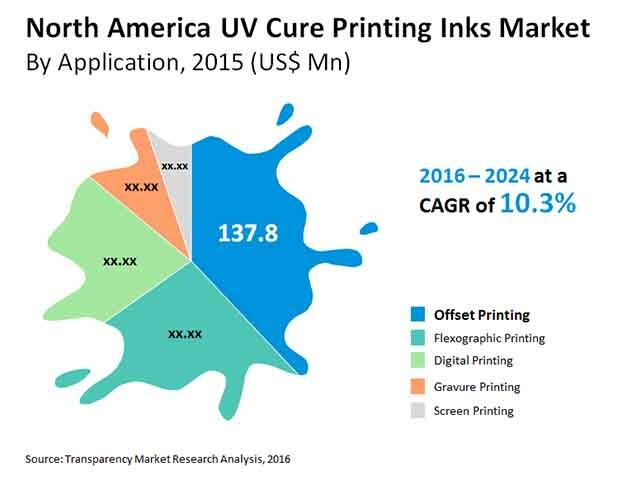 With the imminent upswing in the demand for publication and commercial printing in a number of industries, the U.S. market for UV cure printing inks ins likely to cross US$678.5 mn by the end of the forecast period. Although Canada exhibited healthy growth in the demand for UV cure printing inks in the recent past, the surging trend of e-commerce and e-books is projected to limit the demand for publication and commercial printing in Canada, which eventually, will decrease the sales of UV cure printing inks in this nation and reflect negatively on the overall growth of this domestic market over the forecast period. As per analysts, the market for UV cure printing inks in Canada will reach a volume of only 41.7 kilo tons by the end of 2024. The North America market for UV cure printing inks demonstrates a moderately fragmented competitive landscape with domestic participants holding a large share in the overall market. FUJIFILM Corp., Flint Group, Nazdar, E. I. du Pont de Nemours and Co., Toyo Ink America LLC, Sun Chemical Corp., Wikoff Color Corp., Huber Group, Electronics For Imaging Inc., Siegwerk Druckfarben AG & Co. KGaA, Marabu North America, and INX International Ink Co. are some of the leading players operating in this market. The report provides in-depth analysis and forecast of the UV Cure Printing Inks Market in North America. It includes forecast for the period from 2016 to 2024 in terms of volume (Kilo Tons) and revenue (US$ Mn). Quantitative data has been derived through extensive secondary research of the UV Cure Printing Inks Market in North America. Secondary sources typically include company websites, relevant magazines, government documents, and press releases. The top-down approach has been adopted to derive the revenue and volume figures for the UV Cure Printing Inks Market in North America. Furthermore, the bottom-up approach has been employed to derive data for various application segments based on demand for UV cure printing inks. A combination of top-down and bottom-up approaches helps validate the quantitative data. The data was further validated with the help of primary research with industry experts to ensure accuracy of derived numbers. Detailed analysis of various factors driving the UV Cure Printing Inks Market in North America has been included for astute decision making. Impact of these drivers has been analyzed with data to substantiate research findings. Furthermore, factors restraining market growth have been included for better understanding of the market. Impact of these restraints has been analyzed over the course of the forecast period. The report also comprises various opportunities available for market growth during the next eight years. Opportunities entail untapped or recently explored factors that are anticipated to drive the UV Cure Printing Inks Market in North America during the forecast period. The report includes value chain analysis to help understand the industry thoroughly. Value chain analysis comprises detailed evaluation of the roles of various entities involved in the printing inks industry, from raw material suppliers to end-users. Various processes employed in the manufacture of printing inks have been included in the value chain analysis. Porter’s Five Forces model has been employed to determine the degree of competition in the market during the forecast period. Company market share analysis has been included for better understanding of the competitive landscape. Company market share analysis comprises the market share of dominant players in 2015, based on their production capacities. Furthermore, market attractiveness analysis has been conducted to analyze product segments that are expected to be lucrative during the forecast period. This is based on various factors such as market size, growth rate, profitability, raw material procurement, and competition in each product segment. The report comprises detailed analysis of all the segments in the UV Cure Printing Inks Market in North America and forecast based on current and future trends in the industry in terms of volume (tons) and revenue (US$ Mn). These inks can be classified into liquid and paste. Liquid inks are employed in gravure and flexographic printing processes, while paste inks are used in offset printing process. Pigments are extensively used in printing inks as colorants (except in flexographic printing process). Invisible or fluorescent printing dye stuff is used as colorants in flexographic printing process and some other special applications such as heat transfer printing. Based on application, the UV Cure Printing Inks Market in North America has been segmented into screen printing inks, flexographic printing inks, gravure printing inks, offset printing inks, digital printing inks, and specialty inks. In terms of end-user, the market has been segmented into publication & commercial printing, packaging, and others (textile, decorative inks, etc.). Demand for printing inks in each of its application segments has been analyzed and forecast for the period of eight years. The report also comprises profiles of leading companies in the UV Cure Printing Inks Market in North America. These include Sun Chemical Corporation, Flint Group, Siegwerk Druckfarben AG & Co. KGaA, E. I. du Pont de Nemours and Company, Electronics For Imaging, Inc, FUJIFILM Corporation, Marabu North America, Huber Group, Toyo Ink America, LLC, INX International Ink Co, Nazdar, and Wikoff Color Corporation. Various attributes of these companies such as company overview, business strategies, and recent developments form the core of the company profiles section.